E-learning is having something of a renaissance. In 1993, Internet speeds of 56.6 kbps over copper phone lines were as good as it got for most lucky modem owners. So, a 700 MB training video would have taken 28 hours to download at full speed and 3-5 days at average speeds, which sounds a bit like trying to consume a lake’s worth of water through a drinking straw. The evolutionary leap to broadband and fiber has changed all that though, giving the E-learning industry, amongst many others, an opportunity to flourish. Consumers in the public sphere now have more chances than ever to soak up new information, and the cost savings inherent in being able to deliver training to corporate and government agencies through the use of e-learning tools has not gone unnoticed either. In fact, the global corporate e-learning market is predicted to reach a revenue of approximately $31 billion by 2020. Key Insight: The global corporate eLearning market is projected to reach an approximate revenue of USD $31 billion by the end of 2020. Key Insight: Social and collaborative tools, followed closely by mobile delivery, lead the pack in the list of top learning technology priorities . Key Insight: Worldwide revenues for game-based learning products reached $2.6 billion in 2016 and are predicted to surge to $7.3 billion by 2021. So, it’s a huge industry on the up, but even though it’s added a whole new format to learning, it hasn’t changed the ways in which people learn. People engage best with other people, and they engage better with learning when there is a human voice involved in its delivery. A book on learning statistics that’s as dry as the desert wind is never going to be as engaging as a statistics teacher with crazy hair and infectious enthusiasm. 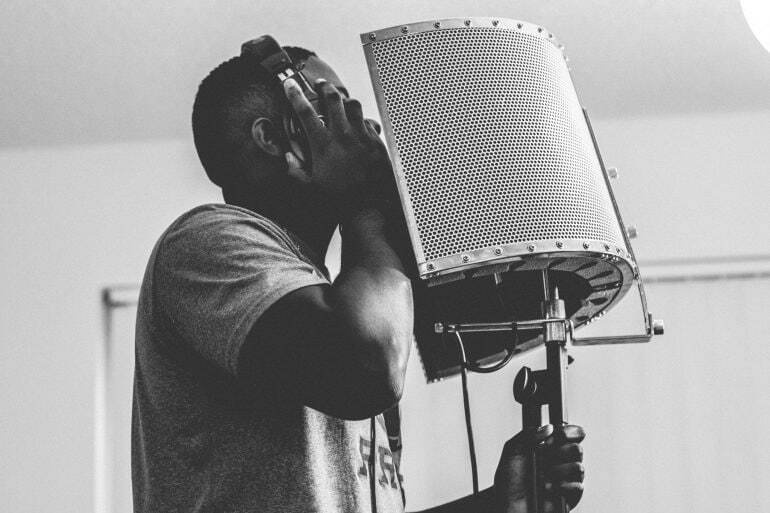 The key element there is personality; it’s what learners connect with and it’s one of the things that a good voice over artist can inject into an e-learning project. Speaking and listening is one of the most natural interactions that humans do. It’s been shown that the brains of speakers and listeners even synchronize during storytelling. Not telepathically of course, but in the sense that the same areas of the brain activate for someone who is talking as someone who is listening to them. This suggests some form of deep connection that we are hardwired to find engaging, which isn’t too much of a surprise given that we are such social creatures, but it’s nice to see research starting to uncover and acknowledge these things. It’s also no wonder then that the voice can add such a powerful extra dimension to e-learning. There is apparently a lot of debate around which of these types of narration is most useful for learning. For instance, a concept for using audio in e-learning called the redundancy principle states that the verbatim subtype is not useful. Respected researchers have said that the narration of every word can reduce a learner’s ability to take everything in and that this kind of double-headed approach might seem patronizing to some learners, giving them the impression that they can’t be trusted to read a piece of information by themselves. In most situations, this redundancy principle is going to hold true, so if you want to use the written and the spoken word on-screen at the same time, you will need a very good reason! But whatever bone of contention the theorists wish to argue over, it’s probably true that the approach that works best for your project is going to be the one that feels right. It helps to know that these different sub-types exist because that way you are aware of them and can experiment before you select the one that fits. Kerry Pascall, Head of Digital Learning at Bray Leino Learning suggests that if e-learning contains lots of text that does have to be read out, try to condense it into bullet points or summaries, then have the narrator give an overview. For complex information, perhaps containing mathematical diagrams or graphs of clinical data, the reader should be allowed to absorb the information at their own pace. The job of the voice over artist in this instance would be to give key information that will provide an explanatory summary. A less obvious example for an appropriate use of descriptive voice over narration would be the typical airline preflight safety video that you watch before takeoff. It isn’t exactly a traditional classroom but it technically is still e-learning, as it’s an audiovisual presentation designed to convey information. The voice over in the preflight safety video offers a couple of things. It goes without saying that the actor will have obviously been picked for their crystal clarity, but their sunny, reassuring tones will probably have helped in their selection too. The right tone has to be a consideration when you need to convey safety information in a palatable way to a bunch of captives about to ride in a compressed cylinder flying on four controlled explosions 5 miles up in the sky! As well as the Redundancy Principle, there are two more that you can use to guide your use of audio in eLearning. These come from the book “E-learning and the Science of Instruction” by Ruth Clark and Richard Meyer, and have been shaped by a lot of focused research. The Modality Principle is a grand name for something simple. It states that your narration should be used in place of written text when the focus on screen is the video or graphic elements that are explaining something. This aids understanding, because the learner is only having to take in one lot of visual information and the auditory information that supports it. If learners had to read something as well as watch a moving image then their attention would be divided and they’d be forced to work harder. The Contiguity Principle is also simple sounding but worth keeping in mind. It states that you should play audio at the same time as the graphical elements that it is describing on the screen. For example, if you’re designing a course to show cash counting methods for a bank, you would have the narrator describe the procedures while the video shows them being demonstrated. Separating the two, either playing the audio before or after the visual demonstration has been found to hinder learning by placing a greater load on learners’ limited working memories. If you ask learners to listen to the words and remember them, then show the video, then they have to recall what was said and combine what they heard with what they’re seeing now in a way that makes sense, which is hard work. This may seem obvious when you read it, but it’s the kind of thing that can be overlooked in production, and it’s more efficient and cost-effective to get it right first time. Always think about what kind of tone you want to adopt for a voice over, as it’s part of the identity of the piece. Using that same tone of voice with the same inflections that explained how to inflate a lifejacket in the airline safety video might not be effective for describing how to assemble a carburetor. A professional voice over artist will maintain the same tone throughout an entire series of e-learning modules. This consistency is important to maintain authority and authenticity and will seem jarring if it drifts. An e-learning script should usually be natural and conversational. A voice over artist will try to help learners feel as if they are listening to someone who is pleasant and approachable, rather than someone just announcing train times. There is some debate about whether learning styles exist, but if they do, then audio delivery might appeal to what are termed “auditory learners;” and a pleasant voice with the right tone may give a much-needed boost to very dry content. A word of caution here: although there are great benefits to including voice over narration, don’t use it just because it’s there. It’s always tempting to use what you know, but it’s best to use only as needed. Narration might help to reinforce particular points and may assist some learners in retaining more information than they otherwise would, so you will need to decide if that’s the case in each project. When cost is an issue (and when isn’t it?) you may be tempted to cut corners. On the face of it, creating an e-learning voice over might look like a fairly straightforward task. You might wonder how hard it can be when you’re virtually an expert on the subject itself, and you are a human who is capable of speech! Why pay somebody to speak when you can speak, right? The answer to that is the same as to why you should let Adele handle the singing duties. As well as having great sounding voices, professionals have already ironed out all the kinks, snags, and pitfalls that can dog a production. Time is money, and you will be encountering all the roadblocks to progress for the first time if you do it yourself. Besides, you’ll have your hands full just preparing your production. To do that, here are several practical tips gleaned from e-learning industry for producing more effective e-learning voice overs. A detailed outline of what you’ll include in your e-learning voice over is essential. Create a list of key ideas and objectives, map out the flow of the script, note the tone, and keep in mind the images, graphics and videos you’ll be using. Even a rough guide will help to solidify the shape of the piece in your mind. Even if you won’t be reading it yourself, write a script in such a way that your learners will feel as though the person behind the voice is a friendly and approachable expert. They need to be respectful, personable, and professional. The script shouldn’t condescend to your learners, and try to keep the voice in the present tense and active. Active voice sentences clearly identify an action and who is performing it, and are much more direct than passive voice sentences. Passive voice: Further information (subject) can be found (action) by learners on our website. Active voice: Learners (subject) can find (action) further information (object) on our website. 100 to 150 words takes about a minute to read aloud and about the same for your audience to read on-screen, so with this in mind, you will be able to work out how many words you need to produce. You may have spent many hours crafting your script to be airtight and erudite, but the written word can deceive you. You need to actually hear your script being voiced before you can really tell whether it works and what needs improving. There is no shame in rehearsing, just consider it a necessary part of the process that lies halfway between quality control and fine tuning the end product. If hiring a professional, ask for auditions to make sure your narrator of choice reads in a manner that is synergetic with the subject matter. As good as your script may be, the gaps between your nuggets of wisdom are just as important as the nuggets themselves. Learners also benefit from a break, in the same way that diners do between courses. Learners need time to digest information and assimilate before they move on. Don’t feel compelled to cram every available second with narrative because you risk overburdening the senses (and patience) of your audience. Silence can also be used as punctuation, signaling to listeners that it’s time to move on to the next piece of information, or else letting them know that you are giving them time to examine something on-screen. Remember that your e-learning voice over is made up of elements that need to work together with none of them dominant. When learners read information, the voice over will help to increase knowledge retention. It should be working in partnership with text and visual elements rather than trying to dominate them. Use the voice over to post questions, give examples or offer anecdotes that serve to illustrate a point. Yet another reason to use a skilled voice talent with professional recording gear: background noise will stick out like a polka-dot bowtie in a military parade and will distract your audience. Anything you can do to reduce the amount of audio clutter in your recording will help the final product no end, so dampen white noise from things like computer fans and air conditioners. You can use free tools such as Audacity to reduce noise later, but it’s better if it’s not there in the first place as you’ll spend less time editing and the final recording will be crisper. A learning video needs a script just like a meal needs a recipe. The script is the map of what’s going to happen, it charts the territory that your learner is going to explore and it presents it in a succession of discrete segments that build upon each other to take them from not knowing to knowing. Even if the subject matter is bland, the script is there to spice it up as much as possible, to make it palatable, and to finally send the learner on their way with new information. It goes without saying that getting the script right is important, so here are some pointers for doing just that. Dictating facts will have all the interest of drying paint. Learners like to engage with a personality that they find appealing, that’s just human nature. So, your script should sound casual and include words like “we”, “you”, and “us” as it leads learners on a shared journey through all the information that you’re asking them to absorb. Check the flow as you go by reading aloud to yourself as you write it. If it feels warm and engaging to you then it will to your audience as well. Your eLearning scripts should only contain as many words as necessary. It’s a fact that people absorb visuals much more quickly and with greater recall than audio. A picture really is worth 1000 words, so your few words need to give an overview or summary of the images on screen (remember the modality principle?) rather than the other way around. Consider your e-learning script from every angle using mind maps, brainstorming and storyboarding. Start with the ‘macro,’ the wide-angle overview of everything where you draw your plan on a big piece of paper with scruffy notes in connected bubbles; then work your way down to the ‘micro’ level which is the close-up view. If you throw it all down at the start, you can then begin to hack away the extraneous bits and then begin to assemble your timeline. Having a final shape in mind for the script before you write it means that it’s much less likely to wander off and get lost. Every industry has its own jargon. It’s a kind of shorthand that people learn to make their lives easier in the jobs they do, but don’t make the mistake of throwing jargon at learners who won’t be familiar with it. If you must use jargon then use terms that they are familiar with only if it truly aids the learning experience. If it’s possible to research your audience ahead of time then do so. If you know your course is aimed at beginners then perhaps jargon is something that you will actually need to teach. If it’s intended for veterans then they will not be put off by jargon terms and may even come to see them as reassuring proof of your authority. As noted earlier, the brain takes in images much more quickly than words. But if those words are used to create images in the mind they can tap into that visual learning mechanism and be far more memorable. There’s a reason that talking about “rising through the corporate hierarchy” is okay but “climbing the corporate ladder” is better. A ladder is something that you can picture, and a picture is something that you can remember and recall a lot faster than something as nebulous as a hierarchy. It’s important not to overdo it, but judicious use of rich descriptors will stick in the memory of your learners and help them to hold onto concepts. It would be nice if your e-learning script was right the first time, but usually, they’re not. Chances are you will need to proofread, edit, and revise your script, although not necessarily on your own. Having someone else look over what you’ve written often means that they will pick-up on the mistakes that you’ve missed through just being over-familiar with it. In the same way, you might find that putting it to one side and then coming back to it later throws up a few errors that you didn’t see before. Probably the best way to ensure that it’s perfect though is to hire a professional editor to comb it for errors and improve the flow. And error checking itself is really important, as a professional voice over artist will probably stumble over bad grammar and spelling. Format your script in a manner that is easily understood by the voice artist you decide to work with and leaves no room for any doubt about pronunciation or style direction issues. See this guide for more details on how to get this accomplished. TO DOWNLOAD A VOICE OVER SCRIPT TEMPLATE FOR E-LEARNING, CLICK HERE. With any luck, your final e-learning script will sound to your learners like something that was written just for them. It will engage them, hold them, and guide them through your presentation as all your material unfolds before their eyes and builds to a satisfying outcome. Your script will also give the voice over professional that you hire the best chance of delivering their best performance, so it’s well worth your time and trouble to make it perfect.